A couple of weeks ago I raised the question and concern about the lack of national coverage and space being given to local organizers in Florida around those seeking justice for Trayvon Martin. While it was good that those with national platforms help shine light on the situation, it was equally important that those who did and continue to the day-to-day work be highlighted and supported for their work…One such group is the Dream Defenders. Make sure you get to know them.. Shortly after Trayvon was murdered and many of us had no idea this took place a group of Black college students started organizing and making a lot of noise.. Calling themselves the Dream Defenders, they did a 40 mile walk from the state capital to Sanford, Florida to bring attention to Trayvon’s murder and since then have been quietly but steadfastly growing and organizing. Currently they have members all over the state.. They have been organizing in different communities around key issues impacting everyday Floridians.. Those issues range from ending voter suppression, ending the school to prison pipeline and making sure there are improved economic opportunities for folks.. 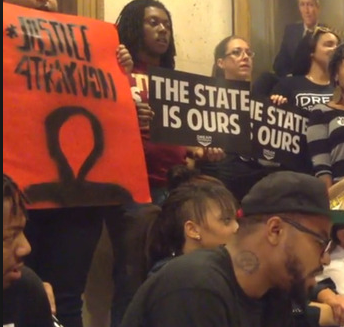 Shortly after the Zimmerman verdict, Dream Defenders went to Florida Governor Rick Scott‘s office and started sitting in and spending the night. After 3 days of protests they had a meeting with the governor late last night. He listened to the Dream Defenders and turned down their demands one of which included him calling a special session to deal with the important issues around Stand Your Ground. They informed the governor that they intend to stay until he agrees to what they have laid on the table.. Early this morning, we did an interview with community outreach coordinator for the Dream Defenders, Jabiri Mickles. He gave us the full breakdown of the sit in and the overall political climate in Florida. He said for the most part things are very tense with many fearful that they are not able to protect themselves from George Zimmerman types. I asked Jabari whether it was feasible for Black folks to arm themselves and under Stand Your Ground laws start fighting back so one doesn’t meet the same fate as Trayvon Martin and most recently Jordan Davis. Mickles noted that less than 3% of Black folks get off using Stand Your Ground defense. That’s problematic and reflects the inadequacies of Florida’s justice system. During last night’s meeting with Governor Rick Scott, when asked whether or not he would repeal the Stand Your Ground, he told the group to go home and pray. Mickles noted that they have prayed and now its time to go to work and get things changed. He also went on to note the importance of not only getting the law repealed but also strengthening the political landscape. He went into detail as to how voter suppression is being carried out in Florida even before voter restriction laws were put in place. he noted that in many places there is a harsh climate of fear with many feeling there will be physical payback if they speak out. We also talked to him about the Dream Walkers which were undocumented Latino students who made national headlines a few years ago when they marched from Florida to the White House and literally sat in president Obama’s office demanding immigration reform. Jabari explained he wasn’t sure if the Dream Defenders had hooked up directly with the Dream Walkers even though they both used the word Dream in identifying themselves. He did note that immigration reform is a big part of what they organize around and a number of immigrant rights organization work with and have members who are rolling with the Dream Defenders. He noted that folks should keep in mind, in Florida the face of the immigrant under siege is Black and not just Brown and Mexican which how many around the country have come to know the battle around immigration. In short undocumented Black folks are being hunted down by ICE trucks and wannabe Minutemen types and vigilante border watchers..
“…since then have been quietly but steadfastly growing and organizing” Quietly? Really? I’ll just leave this here so people have a chance to THINK.